If you are planning to upgrade your Android experience and wish to buy a new LG 4 or Lenovo K8 or Samsung Glaaxy S8 then you have made the perfect decision. However, you must be wondering what to do with your old phone? Well, the simple answer will be to sell it on eBay or Craigslist and get some cash back. But selling Samsung Galaxy phone to any stranger requires certain precautions to take first. For example, you must sign out from your Facebook, Twitter, Instagram and any other social apps associated with your phone. 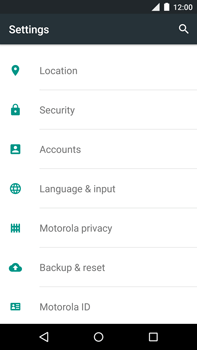 Moreover, you will have to erase all data from your Android permanently so that the new buyer doesn’t take a sneak peek on what you have on your phone. Millions of identities are theft every year and all those information are actually gathered from sold used phones. So unless you want to fall victim of that, you must find a way to wipe data on Samsung Galaxy phone permanently. Fortunately, there are 3 critical ways to wipe data on Samsung phones that we are going to discuss below. Step 1. Turn off your phone and rest it for 2 minutes. Step 2. Turn on your phone by pressing Power + Home + Volume Down. Release the Power and Volume Down button as soon the logo appears on the screen while keep holding the Home button. Step 3. Your phone will enter into recovery mode and here you can use the volume up and down button to navigate through the options. 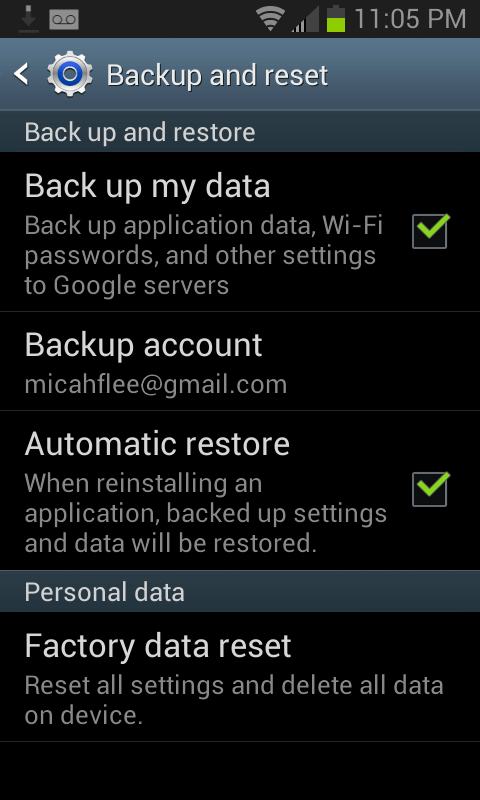 Simply choose “Wipe data/ Factory Reset” option and press the home button to select it. Your phone will perform a hard reset automatically and it may take few minutes. Kindly wait patiently and once the process is completed, your phone will be restarted automatically and you should observe that your phone is totally empty now. Not a recommended method if you are selling the phone. 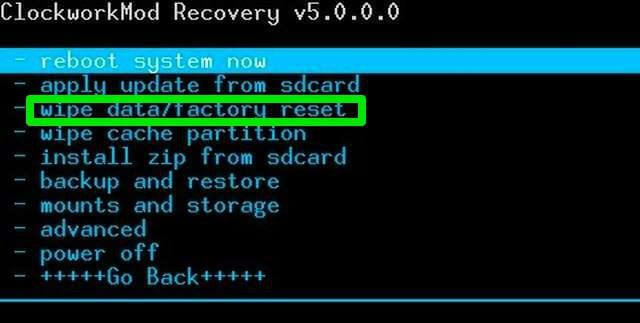 Factory reset only deletes the files from your phone temporarily. Step 1. Tap on Menu and go to the Settings options. Step 2. Scroll down to the bottom and find the “Backup & Reset” option. Step 3. Now, choose “Factory data reset” and tap on it once to confirm the process. It may take few minutes to finish the process and after the progress is finished, your phone will be restarted with slide to unlock screen. Any free data recovery tool can restore all the erased files. Doesn’t let you preview any data before erasing them. Since, we take the privacy of your data seriously; it is highly recommended that you must delete every single data from your phone permanently so that no data recovery tool can retrieve them under any circumstances. Unfortunately, there’s no in-built app on Samsung Galaxy that could make it possible. But fortunately, you can use SafeWiper for Android to accomplish this task effortlessly. 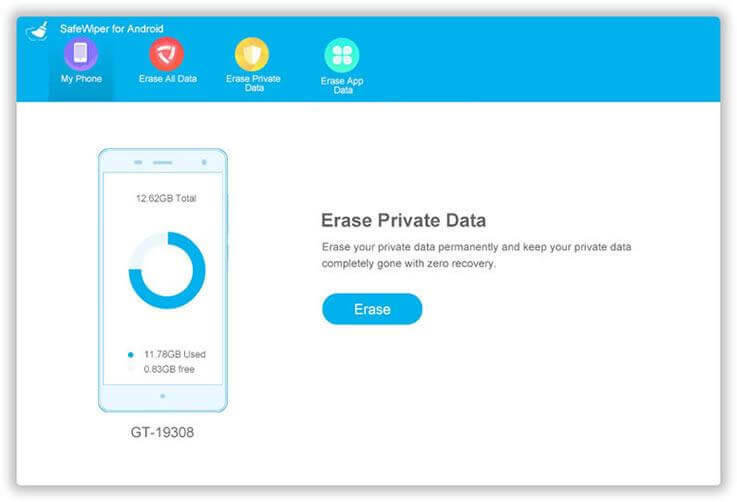 It is an amazing and effective data erasing tool that helps to delete all data from any Android device permanently and when we say permanently, it means that there’s no way you can get them back at any cost. No professional or paid data recovery tool can ever get them back. This program uses very strong algorithms to permanently erase data from your phone that are used by U.S government and FBIs. In short, this tool destroys the files like a paper shredder shreds the paper in pieces. Supported Smartphone Models Samsung, Sony, Asus, Micromax, Google, Motorola, Nexus, LG and other 2500+ models. 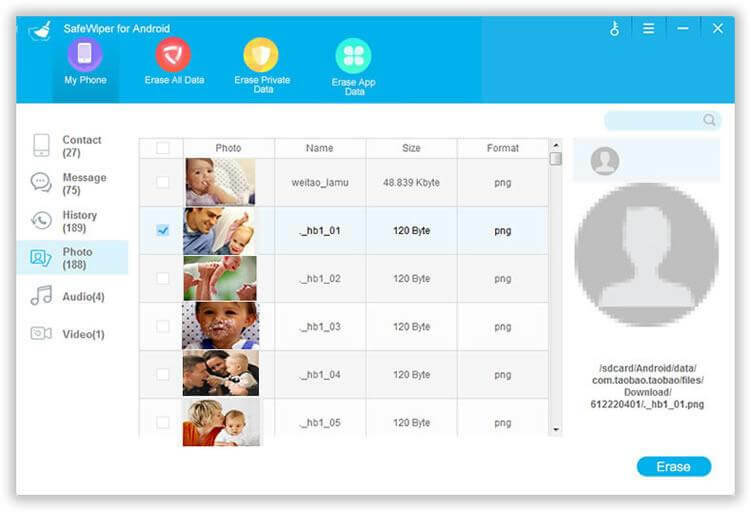 Eligible Data types Contacts, Messages, Videos, Music, Pictures, Call history, Apps, Apps data and other 37+ data formats. First you will be required to install the latest version of SafeWiper for Android on your system. 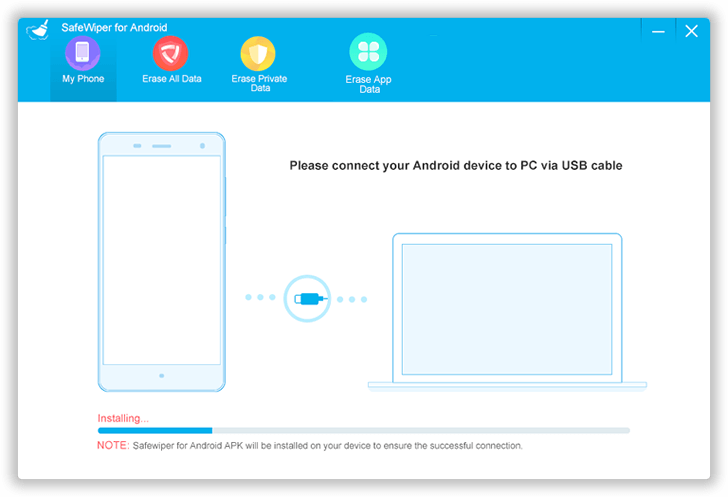 Next, open the program and connect your Samsung Galaxy phone to PC with a USB data cable. Then, enable the USB Debugging mode on your device and click on “Erase Private Data” or “Erase All Data” to permanently delete everything from your phone. Finally, preview the data before deleting them and click on “Erase” to remove all files and information from your phone completely. That’s it. Your phone is totally clean and you are ready to sell it to anyone without any worries now. In this tutorial, we have demonstrated 3 useful methods to wipe Samsung Galaxy or any other Android phone. Obviously the first two methods should be used for personal purpose only but if you are selling your phone then you should definitely wipe data from your phone with SafeWiper for Android. It is the most safe and secure way to make sure nobody is stealing your data and there’s no way to retrieve any files from your phone. In addition, kindly create a complete backup of your device before following any methods from this tutorial to ignore any data loss.